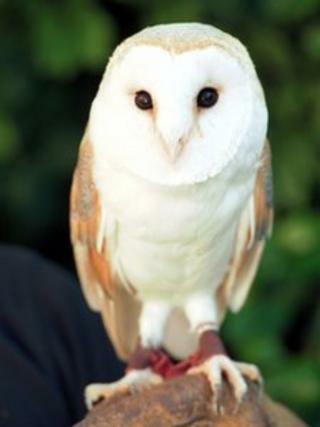 Staff at a zoo in Essex said they were "extremely upset" after a barn owl was killed by a lion as visitors looked on. Colchester Zoo said the owl, named Ash, had been "spooked" during a falconry display and flew into the lion's enclosure in a "dazed" state. The owl had lost its footing after hitting the window of another enclosure, a spokeswoman said. Saturday's fatality was the first in 25 years of falconry displays at the zoo. A zoo spokeswoman said: "Unfortunately she got spooked during an experience and flew right out of the falconry arena and hit the window of another enclosure. "She picked herself up and flew on to the roof of the meerkat enclosure, where we hoped she would settle, but was obviously dazed and as a result flew low across the lion enclosure. "Although she landed on the side of the enclosure, she very sadly lost her footing and fell in, whereupon she was killed by one of the lions. "Everyone involved is obviously extremely upset about such a combination of events but there is nothing that anyone could have done at the time to avoid such an awful outcome."